Gathered around the ministry of Word and Sacrament, Christ Church Lutheran is a gospel-centered community resource serving San Francisco’s Sunset District and surrounding areas, providing diverse opportunities for worship, learning, social action, self-development, fellowship, and recreation for all ages, especially children and youth. Christ Church provides a variety of worship experiences that are meaningful and relevant to those both familiar and unfamiliar with liturgical worship. We are a nurturing community that welcomes all. 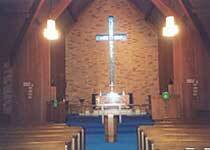 Events at Christ Church Lutheran are visible, well publicized, and responsive to the needs of the community. Word and Sacrament: Equipping believers for baptismal life. Witness and Service: Leading and assisting members in the public affirmation of faith. Leadership and Organization: Identifying, supporting and nurturing leaders and volunteers in the congregation and creating a supportive organizational environment to accomplish our mission.